These topical drops combine proven homeopathic and spagyric substances known for their strong disinfectant and healing capabilities, providing a biological therapy that acts as a fungicide and helps restore the skin. 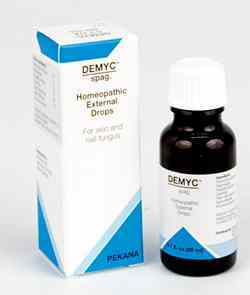 Depending on the type of mycotic infection (hair, skin or nail), use of DEMYC topical drops should be accompanied by a combination of OPSONAT drops, HABIFAC drops and TOXEX drops because mycotic pathogens often will exploit weaknesses on the mucous membranes. There are 2 commonly used topical remedies for skin fungal infections - Of the 2 topical remedies for skin fungus the most effective and commonly used one is SyFungin. In cases where the SyFungin is not seen to produce good results quickly, alternating the SyFungin with Demyc will sometimes resolve the issue. A failure to resolve skin mycoses with either of these 2 remedies suggests the need for treatment of the underlying condition, such as gut fungal dysbiosis or immunodeficiency. Topical use at least twice daily. Until fungal infection resolved. Good response should be seen within a few days when treating skin fungus such as athlete s foot and ringworm. Treatment of nail bed fungus requires much lengthier treatment, such as 6 to 12 months. drops, HABIFAC drops or TOXEX drops because mycotic pathogens often will exploit weaknesses on the mucous membranes. Staphysagria 3X addresses the pain and itching that often accompany mycotic infections. softens the hard edges of wounds to beneficially aid the healing process. accompanying pain and pus, and reliably supports the wound healing process. clean healing of the mycotic burden.